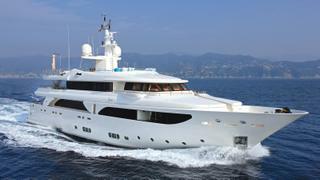 The 43 metre motor yacht Hana has been listed for sale by Simon Goldsworthy at Edmiston & Company. Designed by Zuccon International Project, Hana was built in GRP by Italian yard CRN to RINA class and MCA coded with delivery in 2008 and a major refit in 2016/17. Accommodation is for up to 11 guests in five cabins comprising a full-beam master suite with a private terrace, three doubles and a twin plus a Pullman berth. All cabins on this yacht for sale have entertainment centres, television screens and en-suite bathroom facilities. The main saloon features comfortable seating for up to 12 guests, a bar and an entertainment centre including a 42-inch Panasonic television screen on a rise and fall mechanism and full audio/visual equipment. On the upper deck, a lounge and bar area offer excellent 360-degree views and an outdoor dining area is accessible through two sliding glass doors. Extensive use of glass is a special feature on this yacht, with guests always kept in touch with the surrounding seascape. The sun deck offers additional al fresco lounging and dining options as well as a bar and Jacuzzi. Twin 1,420hp Caterpillar diesel engines power her to a range of 2,557 nautical miles at her cruising speed of 11 knots and she is fitted with zero-speed stabilisers. Lying in Imperia, Italy, Hana is asking €9,900,000.